IGS-1B is a Japanese Information Gathering Satellite that was launched on March 28, 2003 together with its companion IGS-1A on board a H2A rocket. Both satellites were delivered into a 486 x 491 km orbit with an inclination of 97 degrees. The satellites orbited within 37 minutes of each other. In 2007 it was announced by officials that IGS-1B was malfunctioning due to a loss of power. Since that time the satellite’s orbit was observed to degrade. The expected announcement of its upcoming uncontrolled atmospheric reentry finally happened on Thursday, July 26, 2012 at 9:52 GMT. Reentry was located over the Pacific Ocean, about 1,300 kilometers north-east of New Zealand. It is plausible that a considerable amount of fuel was still onboard during reentry of IGS-1B. It’s companion IGS-1A is still in orbit. In the last years, I regularly pointed my camera to IGS-1A and IGS-1B without any spectacular results; the images revealed not much detail. These satellites appeared to be reasonably difficult objects to capture in their original orbits. That changed July 25, when I was able to capture IGS-1B just 13 hours before its reentry in an almost overhead pass in favorable atmospheric conditions. The altitude of the satellite at that time had already dropped below 200 km. The upper set of images show original unprocessed color frames from my video-camera attached to a 10 inch aperture reflecting telescope. 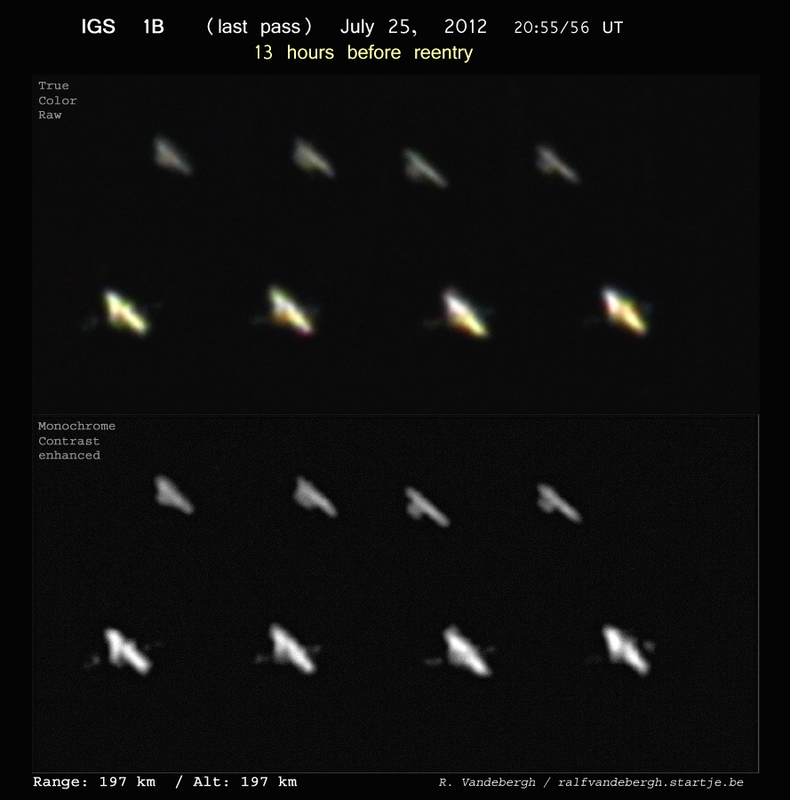 It was one of the objects with the highest angular speed I have captured so far using my fully-manual tracking method. We see clearly the typical golden color of the foil wrapped around the satellite. The stronger processing used in the grayscale images on the bottom show interesting detail. Beside the solar panels – which from this angle are seen only slightly illuminated by sunlight – we see some nice detail on the satellite-body appearing as some knots and ridges that are confirmed by the other images of this frame-set. Searching the web for any pre-launch images of this satellite to compare with, I found out that there actually doesn’t exist published factory-images of IGS-1B or a comparable satellite of this type, only some sketches illustrating the approximate configuration of the satellites (see illustration on top, left). As the website Spaceflight 101 puts it: ”Ground-Based images of classified spacecraft are extremely rare as most of these vehicles are in classified orbits,” making the efforts put into obtaining telescopic photography of this type of satellites all the more worthwhile.